It’s time to take a look at the new Avengers film! This is certainly the big one. It’s the event film that we had been waiting for ever since 2012 when Thanos was teased at the end of the Avengers film. I remember going into the theaters for Avengers 2 and wondering where he was. He did get pushed back quite a bit, but the positive side of this was that it gave time for Marvel to grab Dr Strange and Spider-Man. Otherwise I suppose they would have had to miss out on this adventure. Black Panther getting a film was also fortunate since Wakanda gave the heroes a good place to fight the villains without a lot/ The film definitely lives up to the hype and is one of the best MCU films yet. I do have to say that this review will have a considerable amount of spoilers so do not read further if you haven’t seen it yet. The film starts off rather quickly as it picks up right where Thor: Ragnarok left off. Unfortunately the fight is off screen but Thanos managed to take down Thor and the Asgardians. Hulk puts up a brief struggle, but is quickly beaten and traumatized for the rest of the film. Thanos aims to get all 6 of the Infinity Stones so he quickly sets out on this quest. He sends the Black Order over to Earth to claim 2 of them while he heads for the other 2 himself. He already has 2 so if you add them all up then he will have the six. Iron-Man, Dr. Strange, and Spider-Man decide to bring the fight to Thanos while Captain America and the other Avengers engage his forces on Earth. Meanwhile, Thor is looking for a new weapon which will allow him to destroy Thanos and avenge everyone. In a film this big it is always hard to know where to start off. Do I talk about the many characters or the technical aspects or about the plot itself? They’ll all get mentioned at some point or other so the order doesn’t matter much, but keeping the list orderly is good. As such we’ll go for technicals first. The graphics look really good as you would expect. Iron-Man’s armor is able to do a whole lot of things now thanks to his Iron Man 3 upgrade and he puts them all to use. The nanomachine animations are solid and the energy attacks really stand out. Dr. Strange’s magic is as vibrant as ever and each of the Infinity Stones have their own energy wavelength which are all unique. The character uniforms are all on point from their various films as well. The only character design that wasn’t all that good was Cap’s. Of course Rogers is undercover now so he hasn’t had much time to get a proper haircut. Perhaps in the next film. Thor’s new costume is certainly really good. Black Widow’s hair change is rather random, but not bad. It doesn’t make much of a difference. As far as the soundtrack goes, we don’t get too many new themes. There is the classic Avengers theme that all of the films love which has still aged well and works for all of the scenes. I can’t say that I remember any of the other tunes all that much, but they work well enough in the moment which is the important part. With all of the explosions and attacks going on it makes sense that there wouldn’t be too many tunes. I’m still waiting for a solid rock/electronic theme though. Maybe even a lyrical song like in Thor Ragnarok. One thing you’ll notice in this film is that the heroes are all a tad edgier than usual. Probably a rather normal response considering that the stakes are so high, but they definitely don’t have a problem with destroying the enemies this time around. The heroes do stay true to their word and don’t take any prisoners this time. They all also go for the tough call of choosing to destroy one ally to save many. Star Lord makes this choice as well as Scarlet Witch. Naturally I am always against this call as it’s worth it to let the world burn to save one person, but it’s not a move that I would hold against the character either. At least if the other person is begging them to do it. If it’s against the victim’s will, then that’s a whole different ballgame. I do like how Captain America is the only hero to speak out against this though as he should definitely stand true to his principle of not sacrificing anyone. While the film never gets overly violent, it is more intense than most of the other MCU films. 2 characters get tortured and in general the heroes are getting beaten up quite a bit. The Nebula scene was probably pushing it the most, but it’s certainly not as bad visually as if she was purely organic. The Dr. Strange scene is mostly off screen. I could have done without them, but again, the film was careful not to cross the line here. It also made sure not to bring back the giant animals from the Black Panther film which I was thrilled about. No animal violence here folks and that was really the only concern I had going into the film. Infinity War feels like one of those event films that you only get once in a blue moon. The kind of film that doesn’t slow things down for the general audience and keeps the pacing up from start to finish. Final Wars did this for Godzilla, Resurrection F for DBZ, Hell Verse for Bleach, Batman V Superman for DC and finally this film for Marvel. The whole point of a shared universe is not having to reexplain character origins and trivia for the general audience so we can skip right to the fights. That’s exactly what this film did and it’s perfect. It embraces its comic book nature to a t. The best part about having multiple plots is that if one has to slow down for any reason then we can cut away to another one. All right, I think it’s time to take a look at the character roster. First off we have Iron Man of course. He looks really good as you would expect. I’m glad that he still uses his suit to its full potential with a lot of mixups during his fight with Thanos. Gone are the days where all he would just keep shooting his repulser blasts and call it a day. Now he throws in hand to hand and his suits ability to morph into any object that he wills it too. He doesn’t make too many objects as of course this takes away from his supply of nanites which are limited, but the ones that he does make are quite good. He makes an energy sword/gun that looks like something out of Halo. I still can’t get over how great his new armor is. No more worrying about losing a mask as it can just form more, tech being broken isn’t an issue as it can build more, etc. Considering that Tony is the original genius of the MCU I am glad that his suit reflects that. I agreed with his decision to take the fight to Thanos. Lets be honest, the Earth doesn’t need more cities blown up in a quest to stop him and the group was a fairly powerful one as well. At the very least it’s a tactically sound plan. Ironman is certainly still the true leader of the Avengers in the movies. Then we’ve got Thor. Naturally he gets quite a lot of screen time since he’s in the center of this whole encounter. I don’t like that his fight with Thanos was off screen though. I guess it was probably very hard to write in a scenario where he loses without doing any noticeable damage to Thanos and it would also be hard to explain why the Hulk didn’t jump in sooner. Valid reasons to have it be off screen of course, but that would have been a lot of fun. All I can say is that if Thor had been at full power then he probably would have won, but since he was weakened I can accept his loss. He spends a lot of the film in a depowered state, but still shows off his other abilities such as his durability in surviving the heat of an entire star for a few minutes. Even without calculating the exact magnitude of the feat you know that this is quite intense. Most would melt instantly upon getting hit with the heat at that range. Thor certainly gets a good payoff scene to that afterwards when he finally arrives into the battle. Again, I would have liked a longer rematch between him and Thanos, but I suppose that at this point it would have been tough for Thanos to hold his own. Thor definitely tipped the scaled of battle in Wakanda. Then we have the Hulk. Seeing as how Ragnarok kept up the situation where Hulk and Banner are completely different characters from Age of Ultron as opposed to the more “same person” route that The Incredible Hulk and Avengers used, I’ll list them separately here. Unlike Ragnarok where Bruce actively avoided fighting and just kept trying to hide he was actually useful here. At the very least he certainly did take what happened to the Asgardians quite hard and did his best to contribute in any way possible. He was even able to take on one of the Black Order members on his own which is really impressive. Considering that he doesn’t have any super powers he did good. Unfortunately I can’t say the same for the Hulk. He looked decent in his initial appearance against Thanos. Sure, he didn’t quite win, but he did get some hits in and at least he tried. His character was wrecked in all future scenes though as he was apparently too scared to come out after that. The Hulk is never portrayed as a coward and I think it was a big mistake of the film to do this to his character. No matter what happens from here on out I just can’t forget this. When everyone needed him in their darkest hour, Hulk refused to step up to the plate. As far as I’m concerned he’s no real Avenger anymore. On a more positive note, we have Captain America. Compared to Iron Man and Thor his role is quite small, but still good nonetheless. It was fortunate that he rushed over to back up Vision and Black Widow. His hand to hand skills are consistent as always and it’s difficult for any of the villains to lay a hand on him except for when they are considerably stronger. I do miss the iconic shield to go along with the costume and it does limit how effective he is here, but he always tries his best. He also won’t let himself be pushed around by the government anymore and has definitely grown comfortable in his fugitive roll. I expect to see him take on more of a leadership role in the next film, but of course that could lead to some more bickering between him and Iron Man. Black Widow looks solid as well. She gets two fights against the Black Order and holds her own both times. Her nunchuk weapons are definitely good to have and while she may not have Captain America’s strength, she is on his level when it comes to hand to hand combat. War Machine also gets a nice little appearance as he trolls Bruce and the government. His War Machine armor is still potent although it definitely feels really behind the curve next to the others so I think he is about due for an upgrade. Falcon doesn’t get much to do as just being able to fly isn’t a huge asset to the heroes, but he contributes as best he can. Since Black Panther’s film was pretty recent you would definitely expect him to have a nice role here. While not large, the film still shows that Wakanda is definitely the global leader in tech. Even the Black Order is unable to completely break through their force fields. It’s a shame that they didn’t have more people to also guard the back of the kingdom, but I guess that would be difficult. Opening it up a bit made sense. Panther’s suit is able to block most kinetic energy, but we finally see its limit here as he still takes a lot of damage against Thanos. I definitely had no complaints with him or his supporting cast. One of them was able to help Black Widow in her fight and his sister was going to be able to crack the code on Vision’s gem, but she simply wasn’t given enough time. Dr Strange looks really strong which is definitely good. From the brief scene he had in Thor Ragnarok it was clear that his abilities are better than ever. Unfortunately this also leads to some power level issues which I will go into later, but for the most part I thought he was handled well. I like his usual confidence and he definitely doesn’t fear the villains. When your abilities are only limited by your imagination this attitude is certainly justified. He’s certainly one of the most enjoyable characters and in this film at least I would probably say that he is the best one. Then we have Spiderman. Unfortunately I don’t think the film makers were really big fans of this character. He didn’t look nearly as good as you would expect. The fact that he is still rather young was really played up here to the point where none of the other characters seem to respect him as a fighter. Granted, he only really got to interact with Ironman and Dr. Strange and they love belittling everyone else. Whenever we get a decent Spidey scene like him catching one of the villains’ weapon or landing hits on Thanos, we get counter scenes like him begging for his life. Spiderman should have some humor of course, but he gets serious when necessary and should be treated as a legitimate powerhouse. With his Spider Sense he shouldn’t be getting hit so easily as well. Star Lord certainly looks like you would expect. The team still doesn’t respect him all that much, but at the end of the day he is the leader. He at least tries acting more heroic nowadays since that is what Gamora wants. He does make a rather dicey decision midway through the film which will probably not sit well with a lot of people but I can get behind it. Honestly, the others should have just completed their job sooner considering how much muscle was being used at the time. I do find it ironic how Star Lord is at his best when fighting other heroes. Where were all of his cool thunder gadgets that he used to beat Spiderman and Ironman earlier in the film? He was suddenly portrayed as a really competent fighter there. At the expense of Spiderman though as at least Ironman freed himself pretty quickly. Gamora gets a big role as well since her backstory has a lot to do with the Titan of Terror. She still does well in a fight, but I do think rushing at Thanos was a little reckless all things considered. At that point they probably still could have avoided combat or at least gone in more prepared. She makes the heroic call in giving up the information, but things definitely don’t tend to go her way. It’s too bad we couldn’t see more of her. Rocket Raccoon is a fun character as always. He doesn’t get to do a lot of blowing up yet, but more guns are always welcome in the big fight against alien invaders. Drax continues to be the biggest joke of the MCU as he never gets anywhere close to being considered a threat to Thanos. The guy is just deluding himself at this point. He’s not quite as obnoxious as his TV show counterpart, but at the end of the day I’m just not a Drax fan. He’s still better than Groot though. Groot is just annoying the entire film. He’s still going through his teen rebellion phase and the character should just be written out. There’s never been anything entertaining about his “I am Groot” gimmick and the character doesn’t add anything to the film. Mantis doesn’t do much here, but she always chips in when there is a fight. Her mental abilities are certainly handy after all and being able to control Thanos even for a brief period is impressive. Then we have Vision, the worst character in the film. Everything that went wrong in this movie can be traced back to him. He should have been around in New York to fend off the Black Order but decided to go off the grid for no reason. Okay, he had a reason and it was pretty sad. He just wanted to spend more time with Scarlet Witch. They already get to hang out quite a lot though so he was just being greedy. After that he is defeated three different times by the same Black Order villain. Vision seems to have completely forgotten how to fight and the guy is supremely annoying. I couldn’t wait to see him get blasted to smithereens because just seeing the guy on screen was annoying. He kept begging Wanda to destroy him, but even that is being selfish. He could just crush his CPU himself which would save Wanda some grief and then she would have no objection to destroying the stone as she couldn’t let his death be in vain. Vision is supposed to be one of the power hitters so the heroes were counting on him. Without Vision messing everything up for everybody the heroes would have had a much better chance at securing victory. 2 of the stones would have been on Earth so Thanos would have been forced to arrive with 4 stones. Not to mention that he would be without his Black Order from the start. No way Thanos is able to defeat them without the extra stones. Then we have Scarlet Witch who is fortunately much better than Vision. While Vision was wasting his time trying to be human and losing all of his fighting experience, Scarlet Witch was learning how to master her abilities. She is now shown to be highly proficient with them to the point where she can casually block Thanos with one arm. Unfortunately once again Vision was holding her back so she couldn’t use both arms to fight him. Scarlet Witch was also able to take down several large weapons in a single shot which was a tremendous feat of force. She is definitely a contender for top 3 strongest Avengers at this point as she could probably take down the Hulk. Winter Soldier gets his quick guest star role and looks okay. His main problem is that he is using a normal gun while everyone else has some kind of unique weapon to help them. Honestly he should have asked some of the people from Wakanda for an energy gun instead as they looked a lot more impressive. Fighting mano a mano with Cap would have been a better idea as well. I mean….a normal gun…really? Loki’s role is small, but definitely within character. As with everyone else in the scene I have to question why he didn’t act sooner. Since he had the Cosmic Cube he could have also tried using it to destroy Thanos on the spot as well. Yeah, it could backfire but he would probably die otherwise right? Of course he was definitely out of his league in the situation otherwise so there really wasn’t much more that he could do. Heimdall definitely looked good as he at least gave Earth a fighting chance. Otherwise the heroes would have really not been prepared for the coming attacks. Wong is around for the opening fight scene and contributed a bit which was nice. I do think that hiding in the Sanctum is not a wise move though for 2 reasons. 1. If he doesn’t go help reclaim the Time Stone then the sanctum won’t be around long enough to matter anyway. 2. If people do break in since it’s unguarded…I have a feeling that they would be strong enough to stop Wong as well. Food for thought. Nebula certainly gets one of the most painful roles in this film. Deciding to try and destroy Thanos one on one was also one of the worst plans I’ve ever seen as well. She really didn’t think that one through. Thanos mentions that she was almost successful so I have to assume that he was straight up lying to Gamora’s face. I can’t picture that either. If we trust the illusions then I guess Thanos doesn’t have a whole lot of resistance to stabbing so then a sneak attack is feasible, but I just find it hard to believe that his skin is so weak when the rest of his durability is so good. Perhaps that is the case, but I wouldn’t bank on it. Thanos definitely gets a lot of screen time and seems to be considered as one of the stand out characters. It’s definitely a very different portrayal here as he’s very emotional and even sheds some tears. It feels like a slight retcon from how he acts in Guardians or Avengers, but of course he didn’t get to do much in those movies. He certainly didn’t have much of a chance to explain why he was destroying everybody. His goal of reducing life in half is definitely an interesting one. I was waiting for someone to ask him what will prevent life from getting too large once again, but I guess it would take so many thousands of years for that to happen that it’s rather moot. Anyway, Thanos is a decent villain. I think he was a little too emotional and I wasn’t buying into the act since the rest of the time he was shown to be quite ruthless and to enjoy dishing out pain. Despite the film trying to tell us that he was genuine otherwise, I’m still not sure about that. Either way he makes for a good opponent for the heroes since he is quite strong and has a lot of energy attacks. The Black Order are definitely a solid group of villains as well. I wouldn’t really know any of their names if not for the comics, but I suppose that isn’t important. They each have unique fighting styles and are legitimate threats. The strongest member is probably the telekinetic who fought Strange as he was holding his own even though Strange had his Time Gem at the time. Too bad he always forgets to use it. The power hitter seemed reasonably tough. He was about Spider-Man level but without the hero’s agility and spider sense. Then we had the female villain with the long spear/staff. She seemed reasonably tough, weaker than the first two members, but her hand to hand combat was solid. Finally we had the wraith like guy who kept slapping Vision silly. He seemed to be about as tough as the third member. All told, a respectable group of villains. Now I think it needs to be said that with a film this large in scope there are bound to be a bunch of power level inconsistencies and instances of plot hax. The elephant in the room is Spider-Man of course. With his spider sense and speed there is no way that he should be getting hit so many times. He would be dodging all of those strikes. Fact of the matter is that the heroes should have won the first fight in the city rather easily. Spiderman and Iron Man were more than a match for the power fighter. Meanwhile Strange should have easily beaten his foe by manipulating time. Even without time his magical spells should be up to the task as well. He is the Sorcerer Supreme after all. While we are on the subject, why didn’t Dr Strange use the time stone against Thanos? The time loop it can create is quite potent after all. Even just using it to think of better strategies to fight would have been useful. No point in bringing it just to hide it. Lets face it, everyone knows that the hostage trick will inevitably work on the heroes so keeping it away just doesn’t work. Then for the power levels, I think Thanos’ durability wasn’t too consistent. Blows from the Hulk were shown to barely phase him at all but then later on normal hits from Iron-Man’s group were dealing some noticeable damage. Captain America shouldn’t even be able to block Thanos in this case. Thor should have put up a better fight than Hulk as it was shown that he was more powerful. The two Order members who fought Scarlet Witch were shown to have close to human level durability so a quick blast should have finished them off. I guess at the end of the day what I’m saying is that it always felt like the heroes were way stronger than the villains despite the narrative trying to show otherwise. Even though the heroes were racking up losses like a for glory Captain Falcon I never thought that they should be. Until Thanos got all of the gems and started cheating with the Reality Stone the heroes had the edge the whole time. I felt like they should have beaten Thanos on his home planet, Scarlet Witch should have won in the night fight, Strange and the others should have won in New York, etc. The heroes all felt nerfed at various points to an extent. Nothing crazy, but they really had this win in the bag. Once again I have to stress just how good the fights here were. We really got 3 main fight scenes. The New York Battle, The early battle for Vision’s stone, and the fight against Thanos on his home planet. We got other fights meanwhile as well. These 3 fights were all extremely solid. What the night one did especially well was how it started very suddenly. The Black Order member appeared out of nowhere with his first stab and there wasn’t any obvious build up to his appearance. More films and even shows for that matter should do this. It’s amazing when a sneak attack actually feels like one with no giveaways. The other fights naturally looked brilliantly as well. Again, this is because of how fast paced the film is. It’s exciting from start to finish and feels like a real comic book. The heroes all get to shine and each of the main characters get to have a quick supporting cast moment which helps make this feel like even more of a legitimate crossover film. Some crossovers don’t really put in the same amount of effort, but this one had 10 years of material to use and it definitely grabbed as much as possible. At this point, I don’t think it will ever be possible to have a comic book film match this level of crossover intensity except for a Marvel vs DC film and as much as that kind of thing has gotten easier over the years, it is hard to picture. Another thing that this film did well is not forcing in the humor the way that it did for Age of Ultron. One annoying thing about that film was how everyone was constnantly throwing in a one liner no matter what the circumstances were. That got rather irritating very quickly. The jokes are still around here, but the balance is much better. For the record, from the humor scenes we did get I think it’s safe to say that Star Lord stole the show. He did a great job of mimicking Thor and I dare say that he won his interaction with Iron Man. This is easily Star Lord’s best film appearance and in a way it makes sense since he has left most of his bad habits behind thanks to Gamora. The character whose humor tanks the most is probably Groot. There’s just nothing funny about him at all. I dare say that Drax and Spiderman are close though, but on the positive side to keep things balanced Ironman and Dr Strange are fun as always. The writing is definitely on point. There is maybe a little more language than usual, but is never gets into super edgy territory or anything. Naturally there is an after credits scene so make sure you stick around. It’s one that directly affects the ending as well as the next film which is great since those are the best kind of after credit scenes. This may feel like I’m taking a shot at the comedy ones which are ultimately pointless to the narrative and will never be referenced again, but that’s only because that is exactly what I’m doing. This is a real after credits scene and a hype way to end things off. Now, you might come to the conclusion that Superman is being called in and I don’t blame you, but the person they are calling in instead can certainly put up a great fight and I’m expecting to see her dish out some serious damage. Granted, there isn’t really anyone to fight at the moment, but more fighters is always good to have because the danger isn’t over. Now it’s time to rank all of the MCU films again from best to worst. There have certainly been a bunch and some of them are quite close, but no ties can be accepted. After some thought this is how I rank them. You’ll notice that the films have been getting consistently better lately as a lot of the recent films are near the top. That’s definitely the sign of a quality franchise. Overall, Avengers Infinity War definitely stepped up and delivered what it promised. It brought in a ton of action and quality writing between the characters. It adapted the original comic arc pretty well all things considered. While it couldn’t literally get every character, putting off the film any longer to establish more characters would have been too much. This is a perfect way to celebrate 10 years of Marvel. I highly recommend checking out this film if you disregarded my spoiler warning and read the whole way through anyway. There are certainly a lot of ways they can go about the next film. I could probably make a whole post just discussing the possibilities. Instead I’ll just close the review here. Suffice it to say, it’s going to be tough to top Thanos in terms of power anytime soon. It may be time to shrink in scale temporarily (After Avengers 4 of course) to wind down before going to another big cosmic end game scenario. Another 10 years would be a lot of time to get in new characters so that destroying them will have more of an impact. Of course if it happens sooner you will get no complaints from me. 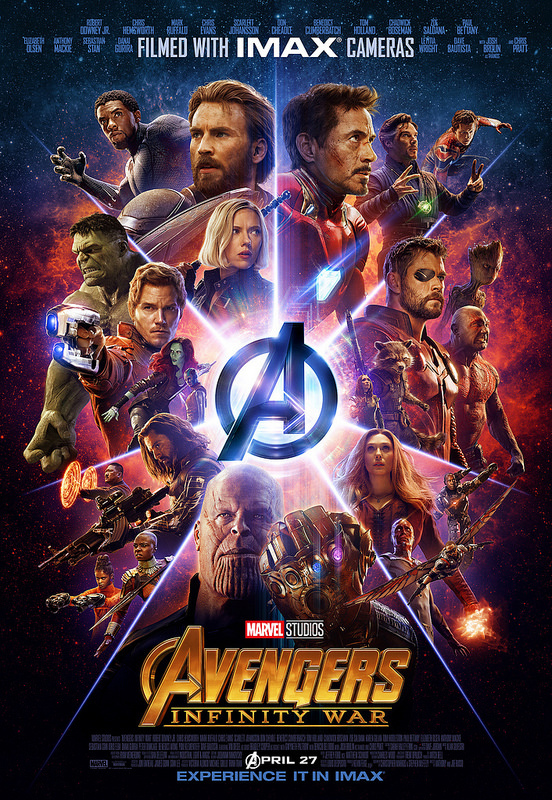 This entry was posted in Live Action Movie Reviews, Live Action Movies, Reviews and tagged Avengers, Captain America, Chris Evans, Chris Hemsworth, Dr Strange, Film Review, Guardians of the Galaxy, Hulk, Infinity War, Iron Man, Movie Review, Review, Robert Downey Jr, Spider Man, Thanos, Thor by dreager1. Bookmark the permalink. Yeah, the film was quite impressive! The ending was definitely very bold and a really hype way to prepare us for the second film. Personally I think they will convince Thanos to snap his fingers once again at the end of the second film to bring everyone back or they’ll have Iron-Man do it. I definitely doubt that the characters who turned into leaves at the end will stay dead. Characters who died earlier like Gamora might stick, but I still have my doubts. Dr Strange was definitely excellent here! Agreed, it’s almost hard to put into words just how amazing it is to see all of the characters together here. They’ve each gotten so much development already as well that it feels like a true crossover event. So many theories flying around for Avengers 4, it’ll definitely keep us guessing until then. I’m really looking forward to a proper Thanos vs Thor rematch. Indeed, sure there will be so much speculation around the next Avengers film, going to be so exciting to see what happens next. I’m certainly hoping for a Thor V Thanos rematch! Definitely well done. These Marvel writers are doing great with their writing and execution of it. I am not one for somber endings but this movie was well done and didn’t dwell too much on the emotions so that we all didn’t have to cry at the theater. Good review! I agree with your assertion that it would have been difficult to actually show the very first battle between Thanos and the Black Order as they boarded Thor’s ship. It would have been a glorious battle! Thor did look great in a few scenes – actually reminds me of EMH! Arrgh! Tis good! Although the stakes are somewhat undermined by the unlikeliness that the deaths(namely Spider-Man and T’Challa) will stick. Oh and Hulk wasn’t afraid of Thanos, I think he was just sick of defending a planet that had people he hated(such as Ross.) He could turn up again in Avengers: Endgame, but I’m not too sure. Agreed, no way those guys won’t die. Well, Hulk not being afraid is what the writers claim for sure, but personally I think he just seemed really scared there. Thanos really put on the pain and since he’s not used to getting beaten like that I think it hit him extra hard. I am hoping that he does better in a rematch though.